No referees, no towels, no medics waiting on standby. The world of ‘Fighting’ is as far removed from the glitz and glamour of the professional boxing circuit as you can get. These fights are scrappy, illegitimate contests held in dingy back rooms and alleyways, for the benefit of criminals and hoodlums out to make a quick buck. Shawn Macarthur (Channing Tatum) is on the ropes when we first see him. Having fled in disgrace from his home town of Birmingham, Alabama, he now ekes out a living in the Big Apple by selling counterfeit merchandise to passers-by. After he becomes embroiled in a street brawl with some small-time thugs, Shawn is noticed by hustler Harvey Boardman (Terrence Howard) and given a shot to earn some money by fighting in a series of illegal bouts. The fighting itself is offset by Shawn’s relationships, the most notable being his newfound adoration of waitress Zulay Velez (Zulay Henao) and the sizzling animosity towards home-town rival Evan Hailey (Brian White,) who has become a professional fighter since they parted ways in Birmingham. The fight scenes themselves are brutal, excellently choreographed surges of testosterone. Each time Shawn puts his fists up, you’re never quite sure if he’s strong enough to pull through. The action is tense and unpredictable, and full of dramatic lucky escapes. Surprisingly though, there aren’t that many combat scenes in the movie. The real meat and bones experience of ‘Fighting’ comes down to the character interaction. The tentative exchanges between Shawn and Zulay come across as charming and realistic, while Harvey, the softly spoken underdog, is fascinating to watch. There’s a glowering menace about most of the supporting cast- even old friends seem a hair’s breadth away from killing each other, should the money fall the wrong way. The opening scenes in particular show the streets of New York as a tooth-and-nails scramble for money and position, where nice guys don’t just finish last- they get trodden on. This is a movie without any deep moral messages or pretensions; it’s made clear, through dialogue between the characters, that there are no trophies or fame on offer for Shawn, should he succeed. It’s all about coming out on top, and surviving long enough to get paid. The plot is bare bones, but in a good way. The characters are allowed to evolve through interaction in front of us, and aren’t bogged down by a lot of unnecessary back story. I particularly liked the fact that Harvey and Zulay’s relationship is left ambiguous- although they insist that nothing ever happened between them, and Shawn appears to believe them, we as the audience are left with some doubts. The soundtrack to ‘Fighting’ is sparse but effective. The music lifts suitably for all the film’s big moments, especially when the drums begin to roll before Shawn’s final showdown. The sound effects during the fight scenes are bone-jarringly intense. You might find yourself keeping a finger on the volume control though; the scenes of conversation are so quiet, and when the music kicks in again you might be blown out of the room if you’ve turned it up too much. The special features are decidedly ho-hum: a few extended or deleted scenes, which don’t really offer any new perspectives on the story, and the theatrical trailer. 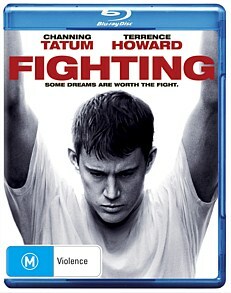 With ‘Fighting,‘ Dito Montiel has directed an enjoyable and believable film. If you’re looking for a deep and meaningful story to mull over then you’d best keep looking. If you just want to be entertained by some great performances, realistic dialogue and thumping fight scenes, your search ends right here.